This surveillance video demonstrates the infrared night vision capability of the AHD-D4W Dome HD Surveillance Camera (AHD CCTV). This video surveillance recording was captured using an AHD-D4W high definition security camera. Initially, all the lights are on in the room to demonstrate the color daytime mode. The camera is mounted to the ceiling in the corner of the room, because of the wide angle lens, is able to provide surveillance coverage of the whole space. When I turn the lights off in the room, the camera senses the low light condition and turns on its built-in infrared LEDs. I turn this computer monitor off so that there is absolutely no light in the room. You can see that the camera's IR LEDS do a great job of illuminating the entire room so that video can be captured in zero light. Notice also how well the infrared illumination is balanced throughout the entire room. You may have seen how other infrared security cameras concentrate their infrared illumination too much on one area and even white out people and objects. When I turn the lights back on in the room, the camera detects the light level, and switches back to daytime color mode. The AHD-D4W is an AHD CCTV camera that must be used with an AHD compatible surveillance DVR. This camera is capable of capturing 720p resolution video. The camera's built-in infrared LEDs allow it to capture video in low light, and zero light conditions. The 3.6 millimeter lens captures a nice, wide angle of view. This camera is typically ceiling mounted, but because the lens is on a tri-axis swivel mount, it can be ceiling or wall mounted. The AHD-D4W is made for indoor video surveillance installations only. CCTV Camera Pros supplies this camera direct for home, business, and government use. For current pricing, and to learn more, please visit www.cctvcamerapros.com/D4W. Thank you for watching. 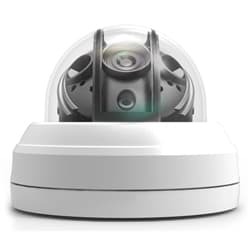 Click here to learn more about the AHD-D4W Dome HD Security Camera used in this video.